Picture it—I had just got diagnosed from my doctor with a severe allergic rash around my lips due to my use of the EOS lip balm. I am allergic to petroleum, paraffin, mineral oil AND beeswax so what is a sensitive skin gal like me to do? First Aid Beauty’s products to the rescue! Exclusive to Sephora stores, First Aid Beauty products are billed as, “allergy-tested and free of parabens, fragrance, and harsh chemicals, and perfect for even the most sensitive skin” . For someone like me who is practically allergic to air this product line seemed custom made for me. I picked up the Ultra Repair Cream, Cream Cleanser and Lip Therapy products and over the past two months me and this troika have become BFFs in caring for my sensitive skin. First Aid Beauty’s Ultra Repair Cream is a medium-weight cream that is a creamy white color with a trace of scent. It goes on very smooth, is almost immediately soothing and my skin absorbed it quickly. It is perfect for a quick blast of moisture if you skin is very itchy. I did try it on my peorial dermatitis around my lips and unfortunately it stung for a little while–ouch! So while it is good for moisturizing eczema-irritated skin, if you have peorial dermatitis I would advise staying away from it. This is a very nice hand cream to put on before bedtime. It isn’t as nice smelling as my L’Occitane Shea Butter hand cream but it gets the job done–especially if you have sensitive skin. 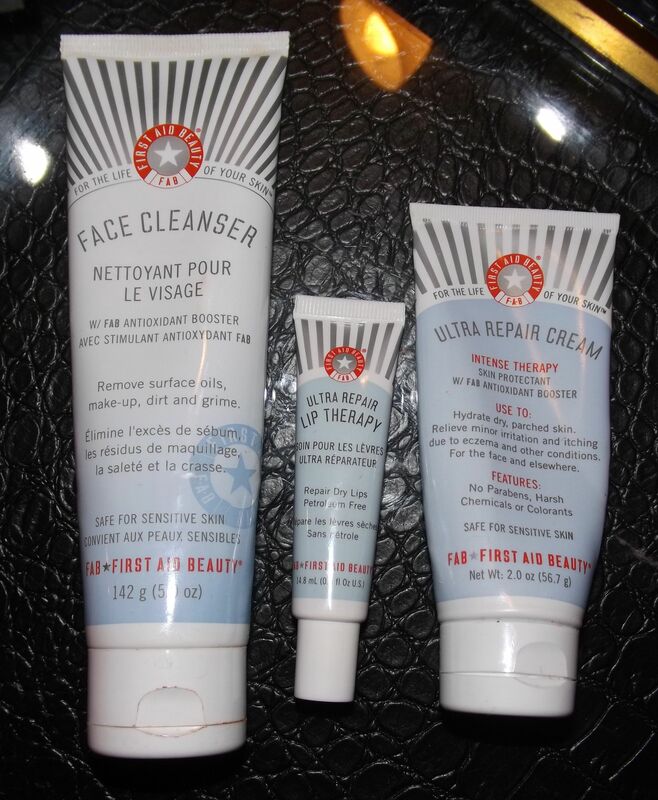 I did test a sample of the Ultra Repair Cream Concentrate which is a solid yet pliable balm with no discernable scent. A little goes a very long way to provide lasting moisture to the skin. On my peorial dermatitis the balm stung a little but the feeling went away within a minute or so. As my skin healed further the stinging sensation upon application went away but as I am sensitive to beeswax (which is in this product) it started to irritate my skin so I discontinued using it. Very disappointed as it is a very moisturizing balm to use. First Aid Beauty’s Cream Cleanser is a pearly white cream cleanser has a trace of a scent and you only need a small bit to clean your entire face. It made quick work of dissolving my foundation, concealer and my sweatproof eye makeup but my mascara hung on a little afterwards. As gentle as it is, it did dry out my peorial dermatitis where it was uncomfortably dry but I don’t see this happening with simple ezcema. I like to use this cleanser to remove the rest of my makeup off of my face after I’ve used a makeup remover especially for eyes. Last but definitely not least, First Aid Beauty’s Lip Therapy is my holy grail when it comes to lip balms. Free of petroleum, paraffin, mineral oil and beeswax, this yellowish creamy balm contains soothing shea butter and jojoba oil among other soothing ingredients. This balm kept my lips moisturized very nicely overnight and I was pleasantly surprised to find out it soothed my peorial dermatitis without any stinging. I’ve never tried this line, but I’ve always wanted to. It’s also sold on QVC.